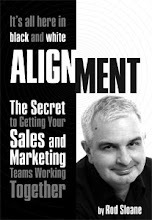 Sales and Marketing Alignment Blog from Rod Sloane: Cracked! So I was relaxing on our sofa a couple of Sundays ago, when I heard a large “Crack!” and I sunk a little lower. I had broken the family sofa! Like a little boy I had to explain this to my wife and how I had not been jumping up and down on it whilst watching Robin Hood. So what to do? It’s dangerous buying a sofa at the moment; you may pay a deposit to a sofa company who go out of business before they deliver. So, I finally looked in Yellow Pages, yes remember let you finger do the walking, for a local furniture repair service. An ad for Stevens Restoration caught my eye because it was local to me and it had a free phone. So on a warm Saturday I called them whilst drinking coffee in my garden. I was surprised that the phone was answered and a chap asked me a couple of questions. Then he further surprised me by telling me to email him in some photographs on the problem and he will give me a quote by return email. No need for a house visit. No having to wait in, for the furniture reply man to come round. Now this impressed me so I got busy, and sent in my photos to get my quote. When was the last time that a supplier impressed with you with the way they operate? When was the last time you impressed your clients with the way you operate? How you can exploit technology to make prospects and clients life easier? How many people do you think I have mentioned Stevens Restoration to?